Toronto Marlies | Kids in T.O. I had nothing to worry about – it was Family Funday. 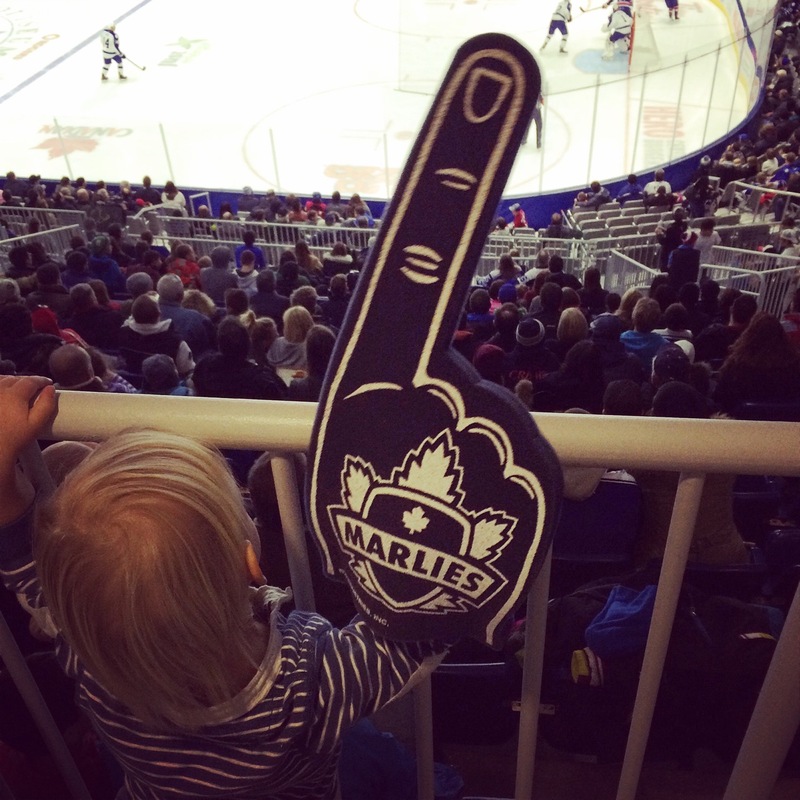 That is, every Sunday home game when the afternoon is loaded with kid-pleasing activities — pre-game energy-burning bouncy castles, interactive games, sign-making and face-painting in Marlies Alley and tons of in-seat contests that draw from the youngins’ in the crowd. Of course, this is a spectator event and even though my kids were surprisingly engaged for parts of the game (mostly anything that surrounded the penalty box), they spent a lot of the time simply cheering and fist-pumping the foam hands, rocking to the music rocking in between plays, and trying to spot (and call over) mascot Duke the Dog in the stands. PS – Marlies Alley is open throughout the game in case you need to sneak out for a break. See below for more ways to keep the kids entertained in and out seats. Getting there: Ricoh Coliseum is off Princess Blvd in Exhibition Place off Lakeshore Blvd. Driving, you’ll find tons of paid parking. On public transit, many streetcar and bus options. It’s also on the GO Line with its own stop (Exhibition) that is one stop west of Union Station on the Lakeshore West train line. Strollers and baby carriers can be brought into Ricoh Coliseum, but not allowed in seating areas. Tickets: Tickets range from $10 – $49 (not bad when Toronto Life recently tagged the average cost for a family to see the Leafs at $654, the NHL’s highest.) For the Marlies, consider a Family 4-Pack starting at $89 that includes 4 tickets, 4 food vouchers, a parking pass and a free Marlies souvenir. Arrive Early: On Family Fundays, the first 1,000 kids receive a cinch bag with a hockey stick pen and activity book. On weekend games, play in Marlies Alley. For the super (keen) fans: Meet Duke the Dog. He’s pretty good at covering the whole area, but if you want to ensure he comes to your row, contact fan services to organize it. There is autograph session after every game. Check out this FAQ Fan Guide for all other need-to-know info. Potty time: Yes to family washrooms and baby change tables. Food: typical concession food and drink. And a place for nursing mothers. DYK (Did you know): You can rent Ricoh Coliseum for skating parties. Connect with the team online.